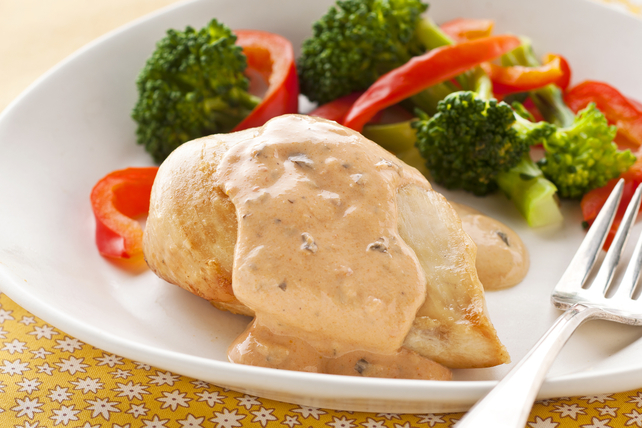 Chicken gets topped with a deliciously creamy herb and garlic tomato sauce - perfect served with steamed vegetables, or a side of cooked pasta or rice. Add water to skillet; cook 1 min., stirring constantly to scrape browned bits from bottom of skillet. Add cream cheese product and pasta sauce; cook and stir 2 to 3 min. or until cream cheese is completely melted, and sauce is well blended and heated through. Serve with your favourite hot steamed fresh vegetable, such as asparagus, broccoli, green beans or red pepper strips. Garnish with 1 Tbsp. chopped fresh parsley or basil before serving.